HONOLULU – Hawaii Supreme Court Chief Justice Mark E. Recktenwald delivered his State of the Judiciary address yesterday to a joint session of the State Senate and House. A video of the event is now available on the Hawaii Courts Youtube Channel. “The judiciary has one mission — to provide justice,” the Chief Justice said. “We offer a fair and impartial forum where people can peacefully resolve their disputes. We strive to ensure that the peace they find is a lasting one by helping them address the causes of what brought them before the courts. And, we provide justice for all, regardless of the person’s background or economic status,” he added. In his remarks, the Chief Justice highlighted the early success of the Community Outreach Court on Oahu, citing the strong support from the Legislature and committed partnership with the Prosecuting Attorney and Public Defender’s offices. Individuals – most of whom are homeless and charged with non-violent offenses such as sleeping in public parks — are given the opportunity to resolve their pending cases by performing community service, while also receiving additional services to set them on a better path forward. He also called attention to significant developments underway to reform Hawaii’s criminal justice system, noting the recent work of two task forces created by the Legislature, each of which included a broad cross-section of participants from the community. The first focused on reforming how the criminal justice system handles criminal defendants who have been accused of crimes, but are awaiting trial. The second task force focused on prison reform, studying effective incarceration policies in other jurisdictions. Technology is also enabling the Judiciary to improve access to justice. For example, the Chief Justice noted a new electronic reminder system on the neighbor islands, which enables defendants in criminal cases to get text reminders about their court dates. And, online filing of civil cases will be available this fall, similar to what is now available for criminal and appellate cases. The Chief Justice emphasized the Judiciary’s continued focus on improving access to justice in civil cases, especially for those who cannot afford attorneys. 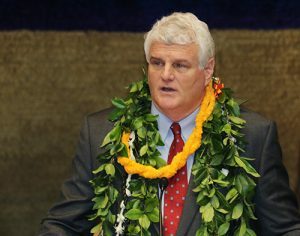 He noted that the Access to Justice Commission recently celebrated its 10th anniversary, highlighting several initiatives, including the work of attorneys who volunteer their time at the self-help centers at the courthouses, a new volunteer court navigator program on Maui, and other programs aimed at helping self-represented litigants. The Chief Justice also asked the Legislature to consider requests for more judge positions and staff to enable the courts to accommodate increased caseloads, and providing needed support services for individuals and families, such as the Community Outreach Court and a specialty court focused on very young children who are subjected to abuse and neglect. Finally, the Chief Justice noted, “… one of the most fundamental challenges we face as an independent branch of government is building trust and understanding of the Judiciary’s mission. 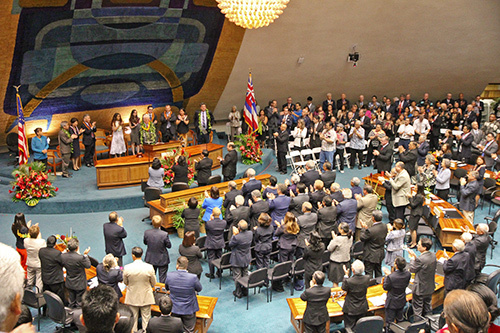 We do this in many different ways.” He noted the efforts of the Judiciary to encourage and protect the use of the Hawaiian language in the courts, including recruiting more Hawaiian language interpreters. He went on to say that, “another important component of building public trust is a judicial selection process that ensures that we have highly qualified judges who reflect and understand our community. Throughout his remarks, the Chief Justice thanked the many partners in the Judiciary’s quest to fulfill its singular mission – to provide justice. He expressed deep appreciation to the Legislature; Gov. David Ige and Lt. Gov. Josh Green; the Hawaii State Bar Association and county bar associations; the American Judicature Society, the Legal Aid Society of Hawaii; Public Defender’s Office; the prosecuting attorneys offices on all islands; the University of Hawaii William S. Richardson School of Law; Department of Education; numerous agencies, organizations, and volunteers; and the dedicated judges and staff, all of whom contribute greatly to ensuring justice for all in our community.